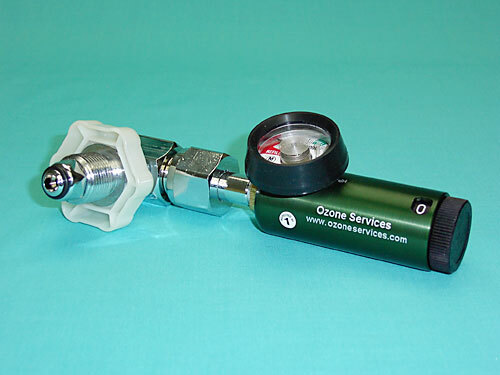 The Ozone Services Brass Core Adjustable Flow Oxygen Regulator is a small, lightweight device that delivers oxygen through an integral flow control valve at selectable metered flow rates. High pressure cylinder oxygen is regulated to 50 psi (345 kPa) before passing through the flow control valve and barbed outlet fitting. 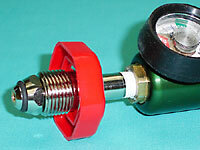 To ensure safe operation, each regulator is equipped with an internal safety relief valve. Oxygen tanks with the oxygen flow regulator with North America standard oxygen CGA540 cylinder valve connections are supplied with the majority of GE and OL ozonation systems produced by our company. 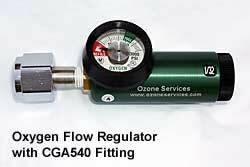 Oxygen tanks with CGA540 fitting are accepted for refill in most medical as well as welding supply outlets. 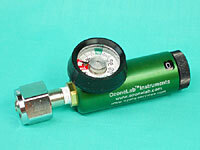 We are able to provide our United Kingdom clients with the following CGA540 adapted oxygen flow regulators for use with U.K. oxygen tanks. International clients should consult our information page prior to considering a purchase. Oxygen tanks with the oxygen flow regulators with CGA870 pin-index cylinder valve connections are supplied with GE and OL ozonation systems upon special request only. The regulator inlet has a reusable rubber and metal seal washer that requires only "fingertight seal". 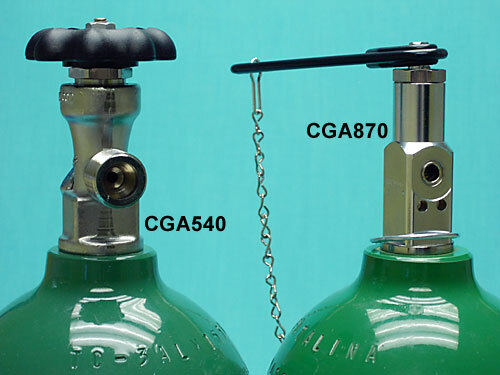 In North America, the Compressed Gas Association (CGA) provides recommendations on cylinder valve outlet connections for specific gas services based on safety considerations. When talking about oxygen fittings, the two standard cylinder fittings are CGA 540 and CGA 870. 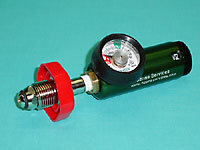 In the United Kingdom, including some of the Asian Countries with a British Colonial past (Hong Kong, Malaysia), it is the British Standards Institution (BSI) which provides recommendations on cylinder valve outlet connections for specific gas services based upon safety considerations. 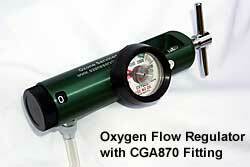 When talking about oxygen, the standard cylinder fitting is BS No. 3.